ST. GEORGE — Earlier this week, the Desert Hills High girls tennis team hosted Pine View with the region title at stake, as both teams were undefeated in Region 9 play heading into the match. Although the varsity players’ matches stayed close for the first hour, the Lady Thunder eventually pulled away for a commanding 5-0 victory Tuesday afternoon, with all five wins coming in straight sets. In No. 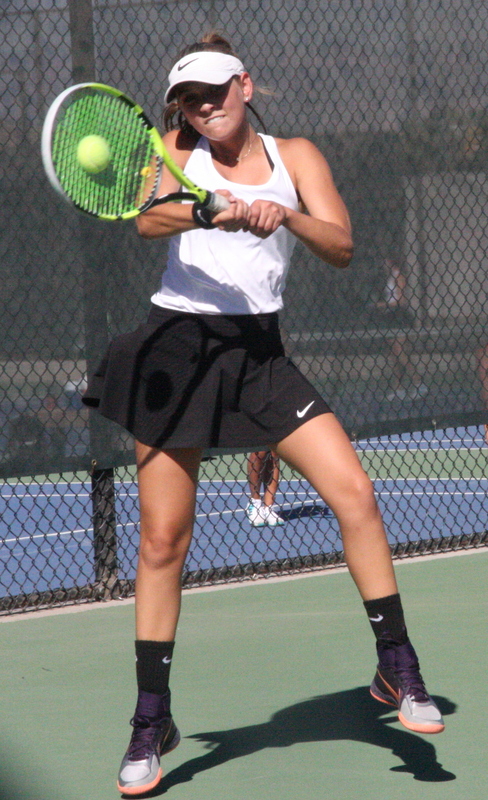 1 singles, Mo Behymer, Desert Hills’ left-handed junior, defeated the Panthers’ Taylor Parsley 6-4, 6-3. After a first set that went back and forth for more than an hour, the more experienced Behymer was able to eventually wear down Parsley with a combination of powerful drives mixed with change-of-pace slices. 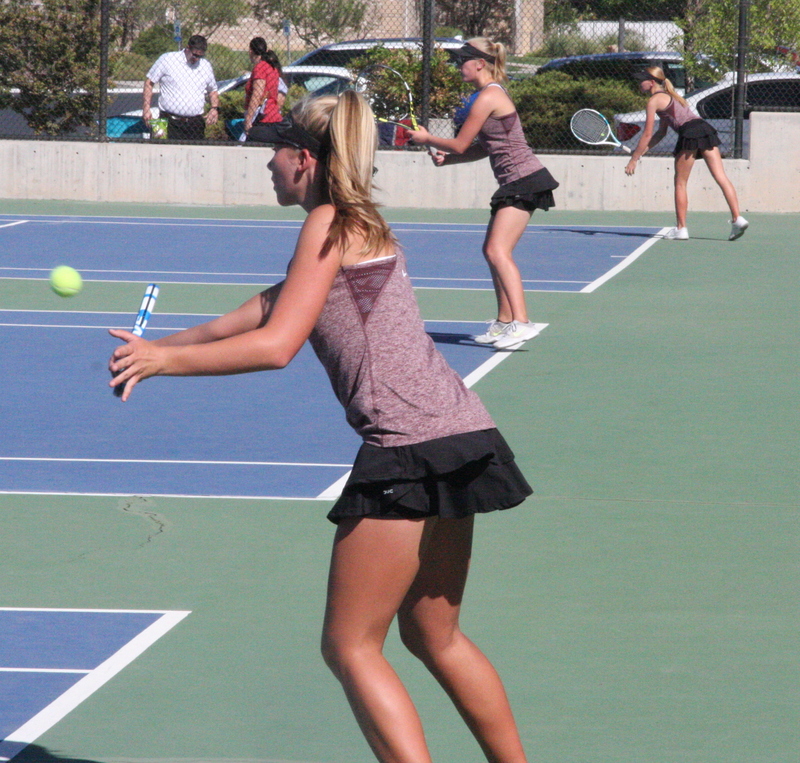 In second singles, sophomore Kenzie Telford of Desert Hills outlasted Pine View’s former No. 1 player Brielle Callahan 7-5, 6-1. Telford came back from a 2-5 deficit in the first set to win the tiebreaker, after which Smith said she “stepped on the gas” in the second set to close out Callahan. Desert Hills’ No. 3 singles player, sophomore Tia Turley, beat Pine View’s Cameron Miner 6-2, 6-1. After falling behind 1-2 in the first set, Turley won 11 of the next 12 games going away. In No. 1 doubles, DHHS juniors Faith Hess and Cassie Kohler swept Pine View’s Olivia Obray and Katrina Hafen, 6-1, 6-0. The Lady Thunder’s No. 2 doubles team also won handily, as Lyndsi Graf, (the only senior among DHHS’s top dozen players), and freshman Averee Beck teamed up to defeat Pine View’s Gabby Hafen and Kate Church in straight sets. Smith, who is in his third year as the team’s head coach, said the victory marked the Lady Thunder’s 11th straight team match win by a 5-0 sweep. The team currently has 46 players on its young roster, with only a handful of them being seniors. All but one of the team’s top varsity players are underclassmen. In other Region 9 action Tuesday, Cedar beat visiting Canyon View and Snow Canyon won at Hurricane, with both contests being 5-0 sweeps. Desert Hills played at Dixie to wrap up the regular season Thursday. The Lady Thunder won 4-1, with Dixie managing to end Desert Hills’ streak of 5-0 wins, thanks to a hard-fought match in No. 1 doubles that lasted more than two hours. Dixie’s Ashley Stevens and Angela Crooks teamed up to defeat Desert Hills’ Hess and Kohler, 4-6, 6-4, 7-5. The two pairs are likely to meet in the finals of the region tournament next week, as they will be seeded No. 1 and No. 2, respectively. Also for the Lady Thunder vs. Dixie on Thursday, No. 1 singles player Behymer had a sluggish start, falling behind Ashley Kezos 1-5. However, Behymer regrouped to win 12 of the next 13 games, defeating Kezos 7-5, 6-1. Behymer has come from behind numerous times in her young career, her coach said. “Mo has had probably five matches since her freshman season where she was down even as far as match point, only to fight back every single time,” Smith said. In No. 2 singles, Telford defeated Dixie’s Kallie Beckstrom 6-2, 6-3, even after being stung by a scorpion two days prior. “I could feel the pain in the side of my foot, but it wasn’t so bad I couldn’t play,” Telford said. In No. 3 singles, Turley also won to finish her regular season with an unbeaten record. In No. 2 doubles, Graf and Beck defeated Dixie’s Annie Heaton and Mychaella Wisneske in straight sets, 6-2, 6-2. “While Averee Beck is only a freshman, she is a high-performance tournament player. Paired with the experience and powerful Lyndsi Graf, the pair are playing superb doubles,” Smith said. In other region action Thursday, Pine View beat Cedar 5-0 at home, and Snow Canyon won at Canyon View by the same score. Although the regular season is now over as of Thursday, all seven Region 9 schools will compete in next week’s region tournament for a shot at the state playoffs. This weekend, Desert Hills will be competing in one final team event: the “Fall Duel in the Desert” invitational Friday and Saturday at Bloomington Country Club in St. George. The Region 9 tournament is scheduled for Sept. 21-22 at Tonaquint Park in St. George, after which the top four qualifiers in each bracket will advance to the state 4A tournament, scheduled to be held at Salt Lake City’s Liberty Park on Sept. 27 and 29. 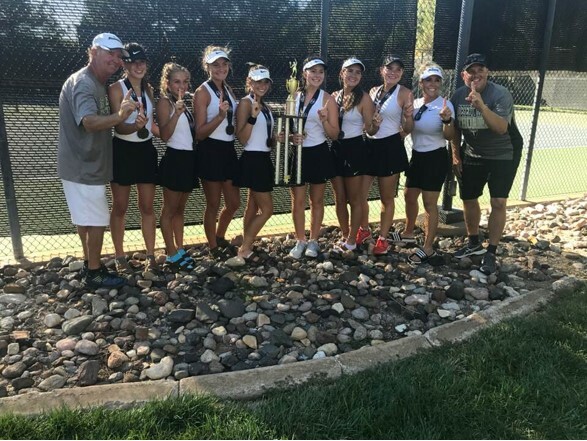 Last weekend in St. George, the Desert Hills Lady Thunder won their second of two Stephen Wade Invitational tournaments, emerging as the top overall team out of 12 teams at the two-day event. Smith said he believes it marks the first time the same team has won both Stephen Wade Invitational events back-to-back in the same season. Desert Hills advanced all of its players to Saturday’s finals by defeating Spanish Fork, Pleasant Grove and Mountain View in succession on Friday by 5-0 scores. No Thunder player lost more than four games in any of the eight-game pro sets played on Friday, Smith added. On Saturday, the Lady Thunder won two gold medals, two silvers and a bronze in the final rounds to emerge as the overall team winner with nine points (lowest point total wins). Reigning state champion Park City was second with 17 points, and Springville was third with 21 points. Dixie High finished in seventh place with 30 points. Winning their respective brackets with gold medals Saturday were Turley, who beat her Orem and Park City opponents in No.3 singles and stayed unbeaten for the season, extending her overall record to 16-0; and Graf and Beck, who beat Park City 8-4 and Pleasant Grove 8-5 to earn the first-place medals in No. 2 doubles. Also for Desert Hills, Hess and Kohler eliminated Dixie’s top doubles team in the semifinal, only to fall to a talented Davis team in the final. Telford also won silver at the Stephen Wade tournament, losing only to three-time state champion Gabby Rockwood of Park City in the final. Behymer lost her semifinal match to Springville’s top player but later defeated Dixie’s Ashley Kezos 8-1 for the third-place bronze medal at the Stephen Wade Invitational.